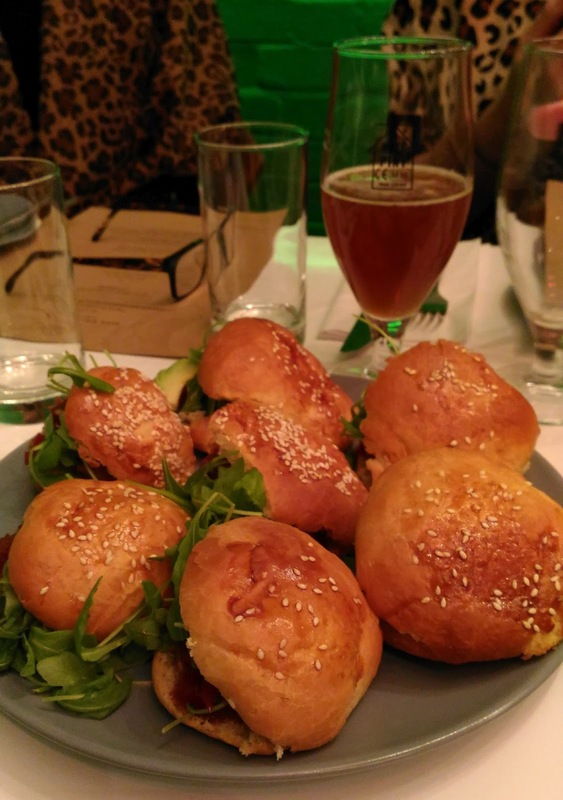 To re-purpose an old joke, beer/food matching events are like buses – none for ages, then three come along at once. 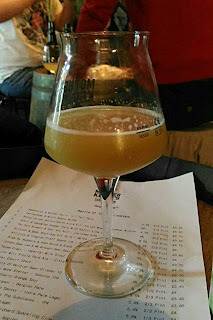 Just to confuse things, I’ll write about the first of the triad separately, as the food-matching element there didn’t coalesce that well, so it ended up being secondary to the chance to taste beers from DE15, which is Marston’s new nanobrewery. Instead, let’s start the following day, with the British Guild of Beer Writers’ annual dinner. A team of four had worked together on curating the menu. 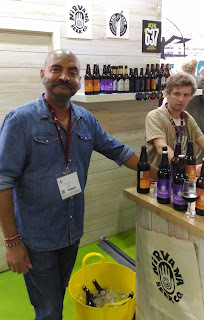 One of them told me some of the staff of the hotel where we had the dinner had joined in too, but to learn rather than advise, as they don’t do this kind of thing routinely – indeed, one reason for running these events outside the ‘beer world’ is to evangelise. We began with roasted Arctic cod, served over a fennel-based bedding and paired with 01/31 Saison from Brew By Numbers, which features two New Zealand hops (Motueka and Wai-Iti) and one Australian (Vic Secret), all of which typically contribute notes of tropical fruit and an assortment of citrus. The Saison was delicious on its own and also worked pretty well with the fish, although for me the latter’s almost-vegetal character didn’t quite mesh with the fruitiness of the beer. The top pairing was the main course: roasted duck breast with roasted salsify, celeriac and orange sauce, matched with Wild Beer’s Modus Operandi, a complex and fascinating sour red ale. This was also the course with a veggie alternative – roasted aubergine and salsify, again with orange and celeriac (among other things! ), but partnered instead with Wimbledon Brewery’s Quartermaine IPA. Of course, everyone simply had to try both beers “just in case”, and yes, the toasty-crisp and malty-bitter Quartermaine could have gone well with either, but didn’t go as well with the duck as the Modus did, while the Modus overpowered the roasted veg. So, great choices there. 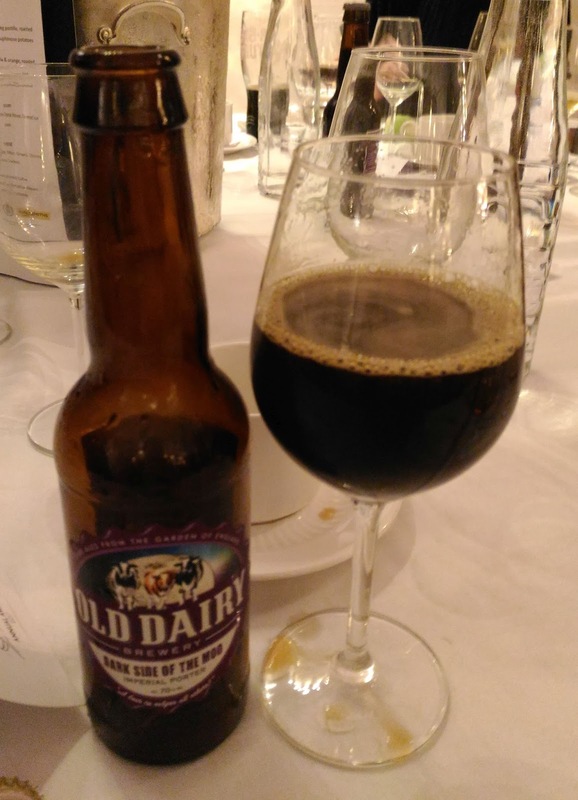 For a change, dessert was light-coloured, but paired with a dark beer – in this case, apple & rosemary mousse with caramel ice cream, with a bottle of Dark Side of the Moo, a 7% Imperial Porter from Old Dairy Brewery. Roasty-dry and pithy-bitter, with notes of coffee, ashes and strawberry, the latter is almost an Imperial Schwarzbier, and it provided an interesting contrast to the creamy-sweet dessert. A good reminder that when you’re food-matching, a good contrast can be even more complementary than a strong similarity. 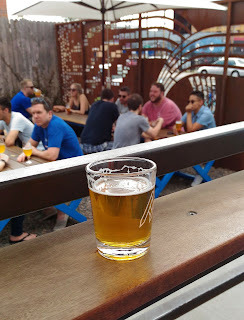 The cheeseboard also brought a less traditional pairing – rather than a Barleywine, or perhaps an ESB, they went for a richly-hoppy and fruity-dry American-style IPA, namely Fourpure’s 6.4% Shape Shifter. And it worked well – the earthy hoppiness, with its fruity and onion skin notes, cut through the creaminess of the cheddars and the other cheeses. The third set of matches the following morning was very different. I was one of a small group invited to brunch by Borough Wines & Beers, a company which used to be called simply Borough Wines but has pivoted into beer in a significant way – you’ll now find a small but well curated range in each shop, and it even brews its own beers in the basement of its Hackney shop, on a nano-brewery appropriately called Brewery Below. Also in that basement are a tiny kitchen and Pete’s Dining Room, which is an event space with – rather unusually – an iron grille for a door. It turns out this is not a prison for beer writers, it’s just that this was originally the basement of a bank, and this was the vault. This time, the menu was all about showing how well a good London-brewed beer can work with spicy food – well, after an introductory beer cocktail. Featuring grapefruit, lemon, elderflower liqueur and Pilsner, this was tasty yet the beeriness was rather low-key. Beer cocktails have been popular in some places for many years, has their time come in London? Anyway, after that it was on to Orbit Neu, a Düsseldorf-style Altbier (yes, there are other Altbier styles) brewed in South London. I’ve enjoyed Neu before but not as it was here, paired with a sweet brioche bun filled with sliced spicy chorizo, a dab of sweet chilli jam, and avocado. And it worked well, the malty sweetness of the Alt complementing and smoothing the spicyness of the food. 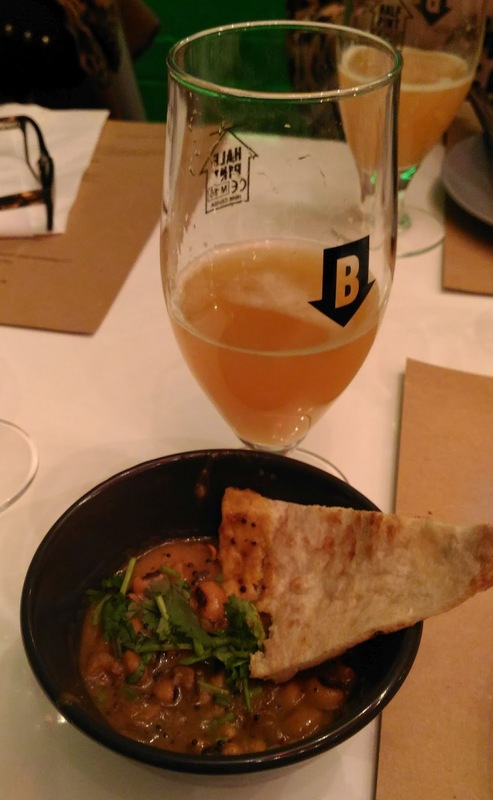 Next up was a sort of daal, made with tarka beans and accompanied by Beavertown’s collaboration The You Zoo. 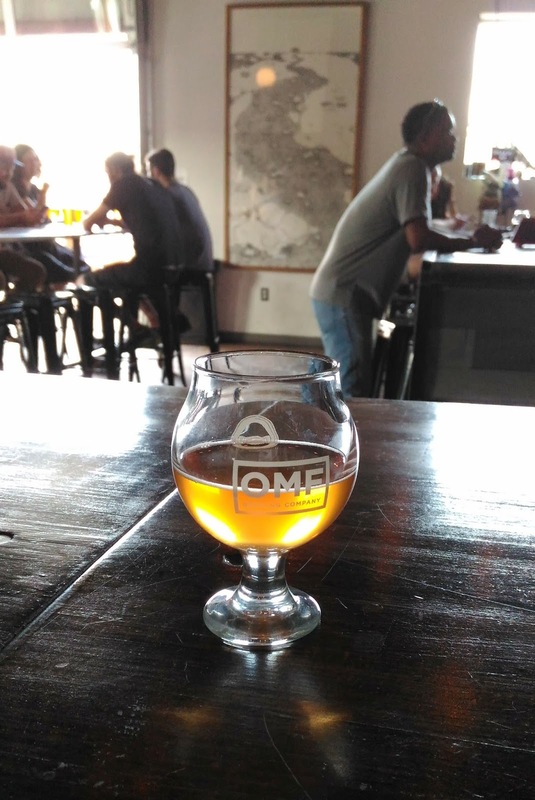 The latter is an IPA which at 7.5% verges on the Double, and features two ingredients that have been very fashionable among edgy brewers in recent years – yuzu, which is a citrus fruit, and tea, in this case Formosa Oolong. To my surprise, it was the food that expanded the beer here, with the daal bringing out the beer’s fruity bitterness. It was fish next – “blue corn smoked haddock arepa” – I had to look up the latter, it’s an unleavened maize bread from South America, so I assume it’s the arepa, not the smoke, that’s blue corn. I also hadn’t realised that blue was one of the many colours that maize comes in, but it is! Anyway, this was served with Hop Chowdah, a 6.9% New England IPA from Mondo in Battersea. Murky and fruity-hoppy with mild peppery and orange notes, this was excellent with the spices. So yes, IPAs and bitters do indeed go very well with spicy food, which makes it doubly frustrating that most curry houses have such crap beer lists. Also frustrating though were my own attempts to do beer and food matching over the holidays. I think part of the problem was that I was trying to match to foods I’d not yet tasted, because we hadn’t finished cooking and they were stuff we’d not cooked before. It’s salutary to recall that in both these cases, the ‘curators’ had worked with samples of both the beers and the menus. You can do a lot with guesswork, but you really need a taste to work with. Ah well. And on that note, I wish all my readers a Happy New Year, full of excellent beer and food. May your bottles never gush and may all your bars be beery ones! It’s ironic, really: the country that saved real ale and cask conditioning for the world is now the one that risks losing it – and all because of an artificial divide that was defined 40 years ago, to serve the needs of a very different time. 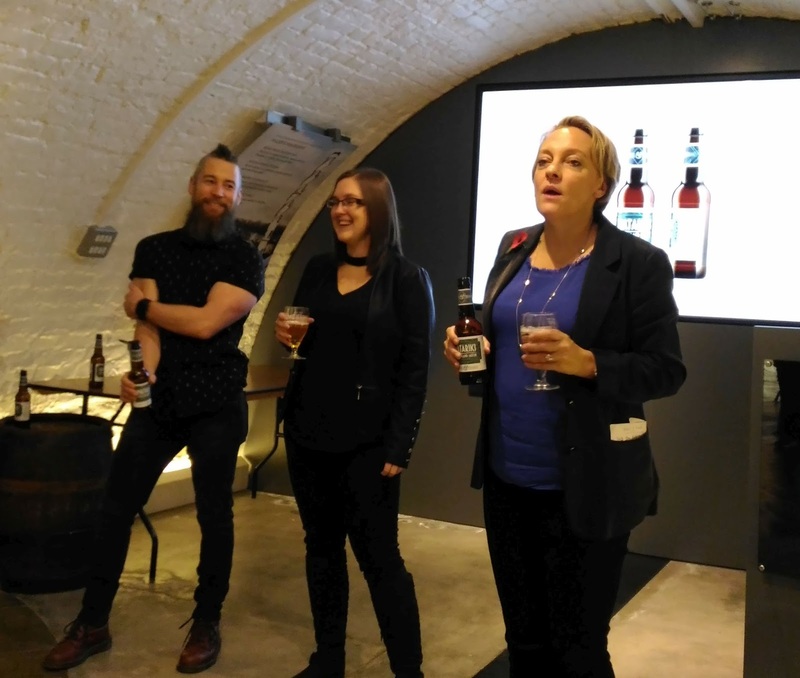 That was one of the messages that came out of a seminar held in London a few weeks ago to mark the release of the 2017 edition of the Cask Report, which surveys both drinkers and vendors on the state of the beer business. A key element in this year’s report is the rebranding of cask as also being craft – something that’s a no-brainer in most other countries, where the presence of a handpump enhances a beer-bar’s craft credentials, rather than distracting from them. 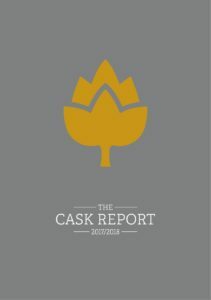 To listen to Cask Report author Paul Nunny, of the quality checking group Caskmarque, cask is a bellwether – or perhaps a canary – for the whole pub industry. He cited statistics showing that consumers as a whole see handpulls as marking out ‘a proper pub’, and that cask drinkers are more likely to move pubs if the ale quality isn’t up to snuff. “Cask drinkers matter because 42% of them go to the pub weekly or more, they are more loyal to their local, they spend more – £1030 a year, 30% more than average, and they are often the ones recommending the pub [to the rest of their party],” Nunny added. In the seminar, several speakers expressed amazement that anyone might think cask ale wasn’t already part of the craft spectrum. Clearly they’re not CAMRA members – even those of us that are quite happy with a cask=craft definition are well aware of the “keg is always evil” diehards. I guess part of the problem is that cask and craft are orthogonal terms. Even if you believe craft is more than just a meaningless marketing term – and many will argue it’s on a par with other empty words such as Premium or Traditional – it refers to a completely different set of properties. Cask ale can be made by hand or in an automated industrial-scale brewhouse, while craft can mean traditional and anti-industrial, or modern and challenging. The trouble is, we’re stuck with both. 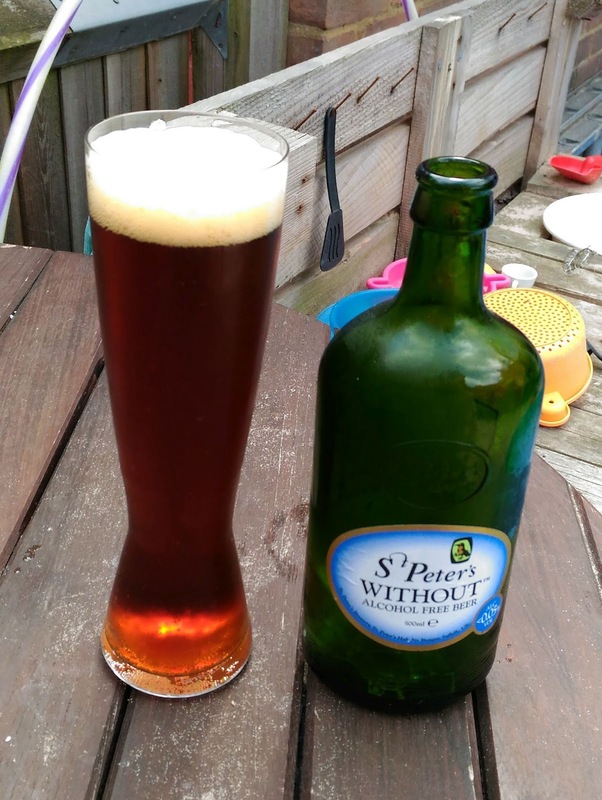 Is real ale too cheap? Or is craft keg too dear? Price hikes could be on the way for Britain’s cask ale lovers, if recommendations in the Cask Report 2018 are followed. According to the report, which is based on a survey of 2000 drinkers, 90% of cask drinkers say they don’t have a fixed budget in mind when they go for a beer. I know that the lower price of cask ale versus craft keg has long been a bugbear for some brewers and bloggers. But rather than criticise the craft keggers for profiteering, they usually complain that cask is too cheap – after all, they say, the ingredients are the same. They do have a point of course, if we can compare like with like, but some craft keg beers use more malt and hops than the average real ale, so they will have a more expensive 'bill of materials'. The distribution task is similar, too. Craft keggers whine that Keykegs and the like cost money and are one-way vessels, which might be a valid complaint if they weren’t thereby relieving themselves of the cost of buying, retrieving and washing casks for re-use. Plus, they do have the option of reusable kegs. But there are also sound reasons for keeping cask prices lower at the point of sale, if possible. Quite simply, a cask goes off once it’s open, so you need to sell it as soon as possible (unless you resort to a gas blanket or other dodgy behaviour that can adversely affect the process of cask-conditioning). Keg on the other hand will stay fresh enough for weeks, so you can afford to keep it on sale longer, while you wait for enough mugs to come along and pay two quid a pint extra for what’s essentially the same beer as on the next-door handpump. Cask Report author Paul Nunny is right that people will pay more for their beer if the offer is right – it’s just that it doesn’t have to be down to beer quality. I know two pubs in Hammersmith right next door to each other. In one, a pint of real ale is £4.50ish, in the other it can be literally half that – and there’s not much difference in variety and quality between the two – in fact the cheaper one probably has the greater variety . The real difference is one is a Spoons and the other a Nicholsons, so you’re paying – or not – for the latter’s nicer ambience, with its trad pubby furniture and feel, significantly fresher air and bigger windows. Oh, and the different clientele, of course. How much extra are you willing to pay for better quality ale? Is the craft keg premium fair and sustainable or just manipulation of markets and fashions? Apologies for the delay in getting this post and the next one online – it's a few weeks now since the launch of the Cask Report and the accompanying seminar for licensees and pub operators on how to make more of cask ale, but work intervened and my reports fell through the cracks... Oops. Waitrose is the place to shop tomorrow, or so it seems! 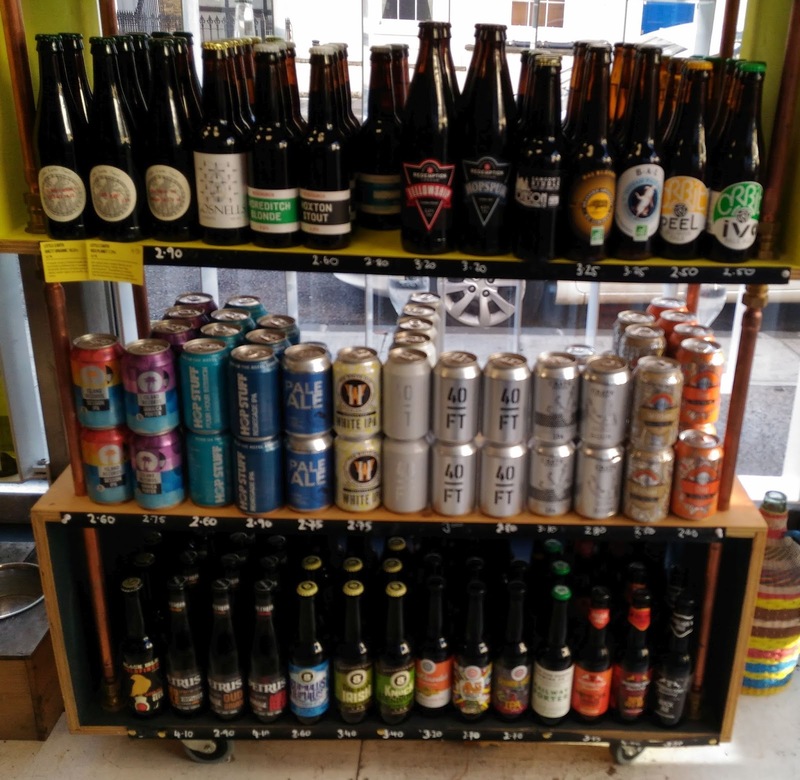 The upmarket retailer has snagged itself a bunch of interesting beer exclusives, and Monday 13th November is when they’re due to arrive on the shelves. (edit: maybe wait until later this week before going in - if my local branch is anything to go by, they'll go on the shelves as and when the delivery happens and the staff have time...) It’s not just the Fuller’s & Friends mixed six-pack of collaboration brews, which I’ll write more about in a moment – the others I know of are two more bottled Fuller’s beers, namely the 10.7% Imperial Stout 2017 and Vintage Ale 2017, and an exclusive beer from Thornbridge. The latter is a Gose made with watermelon juice. Originally brewed by Londoner Josh Smith, it was the winner of the Waitrose-sponsored 2017 Great British Homebrew Challenge, and one of the prizes is this competition is to have your beer brewed commercially by Thornbridge. 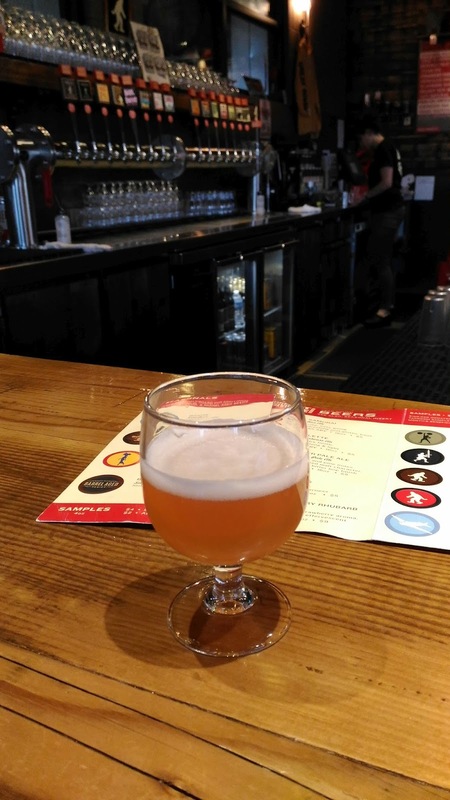 The beer’s name, Mr Smith Gose To…, references both its brewer and the 1939 Frank Capra film, ‘Mr Smith goes* to Washington’. By coincidence, I met Thornbridge’s head brew Rob Lovatt, who was one of the Homebrew Challenge judges, at the launch of Fuller’s & Friends – he is also one of the latter. He noted that one of his aims with the 7.1% Fuller’s/Thornbridge brew, a Red Rye Ale named Flora & the Griffin after the two breweries’ mascots, was that it would age well in bottle – all six F&F beers are bottle-conditioned. Explaining the F&F project, Fuller’s head brewer Georgina Young said that although the idea came from her predecessor John Keeling, who is now brewing director and brand ambassador, a lot of the drive behind F&F came from Fuller’s marketing department and from Waitrose itself – after all, you can’t do something like this if you don’t have an outlet for the results. She presented the six, and their brewers, more or less in order of ABV, so first up was the 4.8% collaboration with Fourpure, which is also the only lager in the set. Some have already given Galleon dry-hopped lager the new-fangled tag of India Pale Lager, or IPL, but it’s much more about aroma and flavour than bitterness. 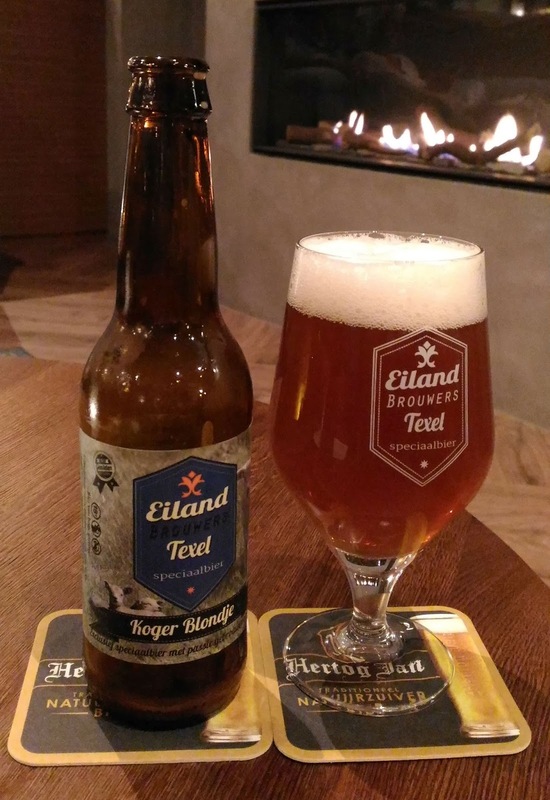 The brewers were keen to use the new Loral hop; it has floral qualities so they then paired it with the grape character of Nelson Sauvin hops. 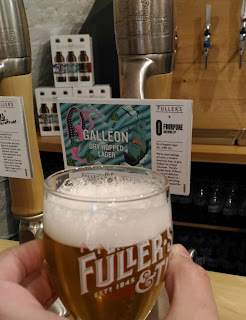 I’ve had dry-hopped lagers before so wasn’t expecting a lot, but Galleon – the beer's name is meant to reference the meeting of old and new on the Thames – really impressed me, especially as I was incredibly lucky to try it cask-conditioned from a handpump, as well as in bottle. As Georgina explained, “We thought for fun we’d run off a firkin [cask] of each beer. I’m not sure it’s right for all of them…” Well, I don’t know about the latter, because this cask lager was excellent – fresh lemony malt overlaid with spicy-sweet and floral hops, and a mild pleasing bitterness. It’s also quite possibly the first cask beer that kegophiliac brewery Fourpure has ever produced, and it showed just what they are missing by shunning cask. Fuller's Hayley and Marble's JK. Next up was what was probably my favourite of the six, albeit just a nose ahead: Matariki, a New Zealand Saison brewed with Manchester’s Marble. Dry-sweet and lightly funky, with notes of golden malt and grapes, it was best on cask which gave it a slightly creaminess, but is still jolly good in bottle. Its name is a nod to the seasonal origins of the style, said Hayley Marlor, the Fuller's half of the collaboration – Matariki is the New Zealand name of a constellation that appears around harvest time. Rebirth, the 6% collaboration with Bristol’s Moor Beer that takes the original 1971 recipe for Fuller’s ESB and gives it a 21st century twist, was the only one I’d already tried on cask back in the summer. Where that version was lightly resinous and jammy, with herbal bitterness, this one is more toffee and marmalade, with bright hoppiness. "We did tweak the recipe slightly as we had it too dark, but it is the same beer," said Moor’s Justin Hawke, adding that the other difference from the pilot is of course that he brews all his beers unfined. A notable oddity is that where NE IPAs are usually cloudy, this one came out clear – “I don’t know what happened there,” said Henry. I checked though, and it was also one of only two beers in the set that weren’t pilot-brewed. The justification was that Cloudwater rarely repeats its beers, but I fear it showed. It’s definitely not a dud – it’s a nice beer, richly hoppy and fruity-crisp – but I suspect it’s not what it could or perhaps should have been. Also 7% but saved for last as it is both the only dark and the only smoked beer in the set, is Peat Souper, a collaboration with Cumbria’s HardKnott that was designed as a way to make HardKnott’s impressive Rhetoric #4 12% Imperial Stout more accessible by hybridising it with Fuller’s Black Cab and London Porter. And amazingly, it works! If you know the three beers, you can detect them all in there - rich and lightly smoky Rhetoric, chocolatey Black Cab and faintly roasty and vinous like the London Porter. Hardknott’s Dave Bailey said the biggest problem had been the amount of notoriously pungent peat-smoked malt in the recipe, which Fuller’s staff had worried would taint subsequent brews in the same vessels. They suggested halving the amount, but he stood firm and eventually won – they had to start at 4am as the last brew of the week, but were able to use the peated malt because the brew was timed just before those particular vessels had their six-monthly overhaul and extra-deep clean. 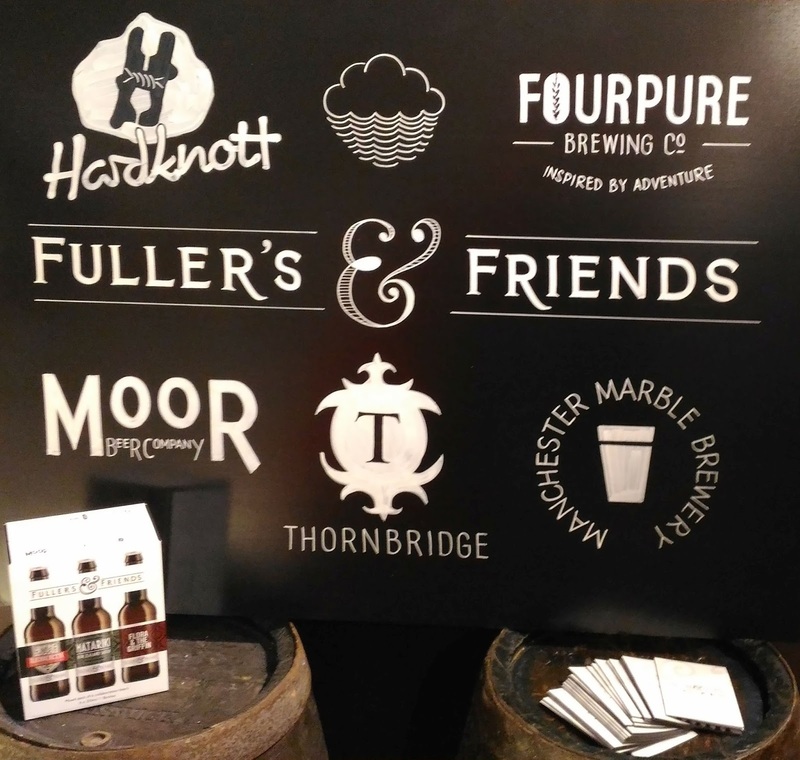 The value for Fuller's – which as Georgina Young says, now "embraces doing collaborations with partners big and small" – seems clear too. Of course, the big thing is the marketing opportunity, and you can certainly see why they're pitching the boxed set as an ideal Christmas gift for the beerily-inclined! But there's also the 'rising tide that floats all boats' aspects. All the brewers involved seem to have learnt something, whether it's guests who normally brew on something eight or ten times smaller and non-automated, or Fuller's brewers who had never manually dug out a mash-tun before! And just as importantly, they all appear to have had a great time. *I’m afraid that when I see attempted puns like this, my first thought is that someone doesn’t know how to pronounce Gose (hint: “Go-ser”). Ah well, never mind – I plan to buy and try the beer anyway! I heard a sad bit of news from organiser Christine Cryne last night: the 2018 London Drinker Beer & Cider Festival will be the last. The hall in the Camden Centre is closing, and in the absence of anyone willing to take over running the festival and find it a new venue, that's it. They want "to go out with a bang" though, and have lots planned for the final edition, which runs from Wednesday to Friday, the 14th-16th March. 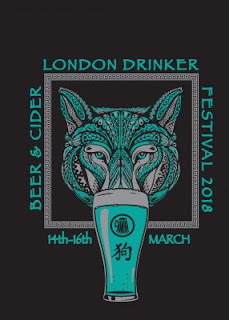 It includes judging the Champion Beer of London, competitions for the best low-alcohol (3% or under) beer in London and the best amateur cidermaker, a bring & buy stand, tutored tastings with five London brewers, a free pub quiz, and a VIP session for CAMRA members. And once again all the draught beers, cask and keg, will be London-brewed or from members of the London Brewers Alliance, which includes a couple from a little further out. All this info and more is in the downloadable festival newsletter. The festival will be officially opened by Fuller's John Keeling, at lunchtime on Wednesday 14th March. I didn’t manage to fit as much into the evening as I’d hoped, partly because the jetlag was catching up and partly because I’d already knocked off the low-hanging fruit. 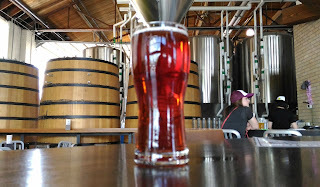 One place I did want to go, because I visited the brewery a dozen years ago and wanted to catch up, was Great Divide. 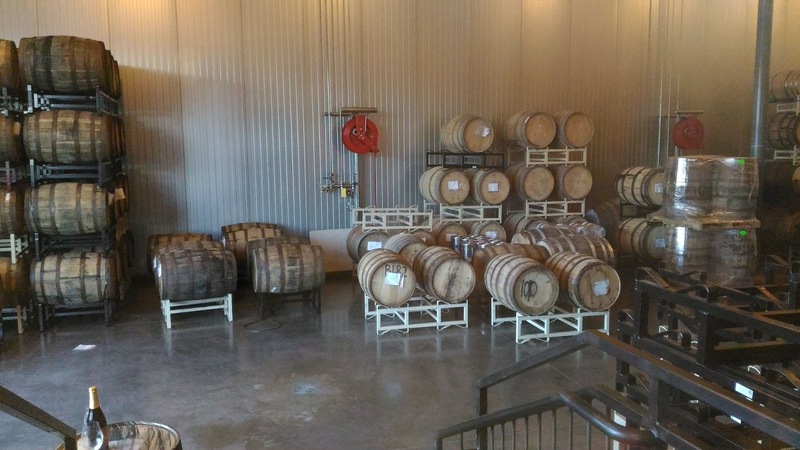 They’re down-town, but fortunately they also have a site now in RiNo where their barrel-ageing and packaging takes place. Of course there’s also a taproom there, and it’s within walking distance of a few more breweries, so that was target number one. In hindsight, perhaps I didn’t need to walk everywhere. As well as city buses – for a US city, Denver has a very good public transport system – there’s the inevitable Ubers and Lyfts, and a free shuttle looping between the various arty nexuses. Walking gave my brewery crawl a focus though, plus you see more, and I think I only saw the shuttle once, so I’ve no idea how long the wait might have been! The walk over to Great Divide reminded me just how much this isn’t a walking part of town, however. Run-down low-rise business premises, dusty and sun-bleached old houses – and roadworks, lots of them. Then you suddenly reach a regenerating area: the side roads are still dirt and gravel, but the scruffy yards surrounded by chainlink fencing are interspersed with well-lit new buildings, with more still under construction. Like most of the other buildings, Great Divide’s barrel store is just a box, but one with large windows through which you can see – yes, barrels, lots of them (though it is by no means full, not at all). It’s a warm and easy place, though its location away from the main population clusters may explain why it closes at 10pm most nights. 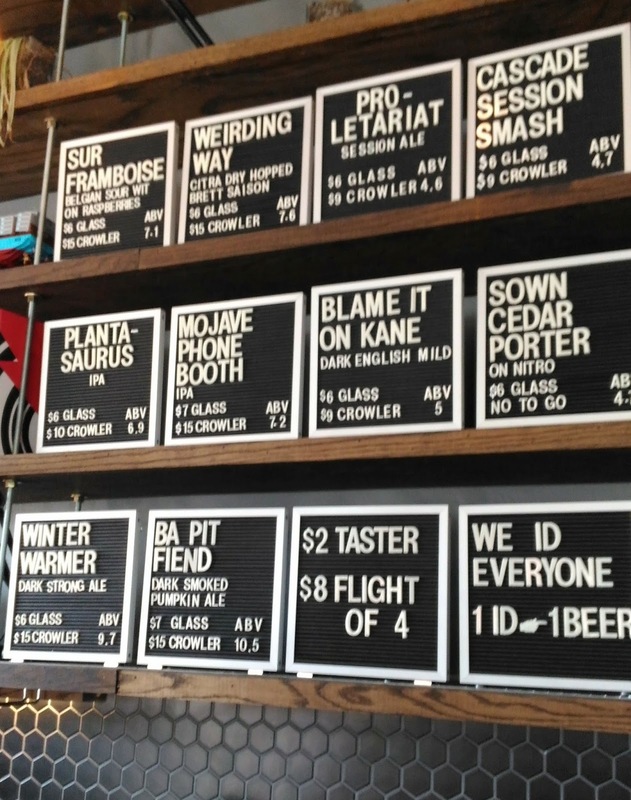 The bar itself is quite typical, with a long row of taps along the bar-back, and a list that includes several Farmhouse ales/Saisons and sours, reminding me that the sour beer fashion is still in full swing. My curiosity piqued, I ended up trying three Saisons – Colette, Apricot Colette and Nadia Kali, the latter including hibiscus, ginger and lemon peel – and the Strawberry Rhubarb sour, before finally tackling the brewery’s flagship Yeti Imperial Stout, in this case in its 9.5% Espresso Oak-Aged version. I wasn’t wowed by the latter. Compared to the regular Yeti which I’ve had before, this version was just too much – especially too much bitter coffee and burnt bitterness. In hindsight it’s possible my tiredness had affected my palate, but still, I’d love to try blending a bottle of this with regular Yeti to see if it would integrate everything a bit better. All the other four were rather good, with the funky-spicy and peppery-bitter Colette at 7.3% winning for me. It’s a great example of a style that’s already complex and interesting, without the need to tart it up – although to be fair the apricot version did run it a close second! 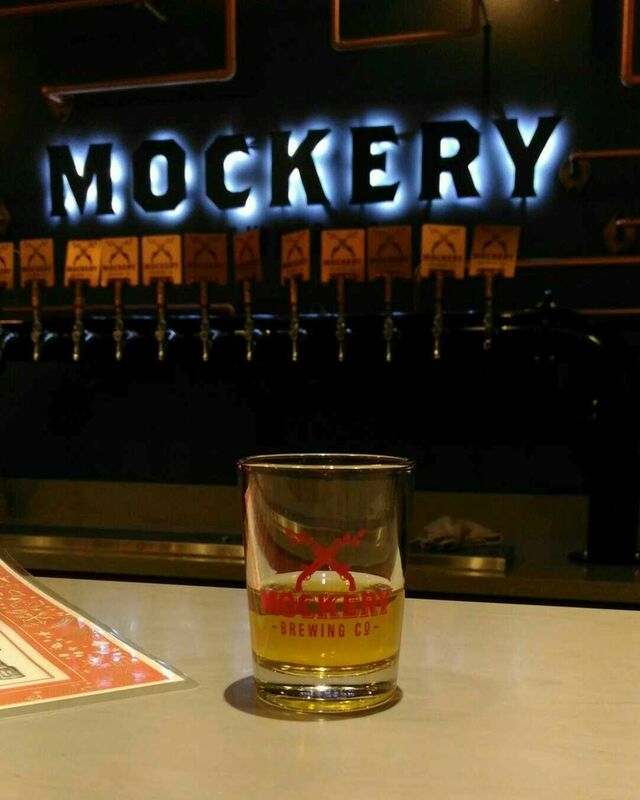 Mockery Brewing, a short walk away down an unpaved street, is rather different. Set up just three years ago when this area was taking off*, it pitches itself as a bit of an iconoclast (hmm!) and sure enough its beer list is eclectic. There’s the usual IPA, Blonde and barrel-aged, but there’s also Bretted and fruited beers, a salted Scotch ale, and what was meant to be a smoked Weizen, although it wasn’t a patch on the Schlenkerla Weizen which for me epitomises this “style”. Best of the bunch were a well-made peppery and estery Rye Saison, and Funken Stupor, a dry and spicy Bretted pale ale that was a collaboration with Novel Strand. The latter is a Denver brewery so new it isn’t even open yet – no signs of a saturating beer market here yet, eh? The funny thing is that although Mockery ought to feel pretentious, it didn’t. 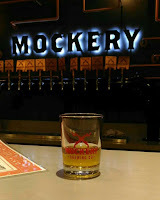 Arty and modern, yes, but the vibe was friendly and fun, and the beers were all decent or better. 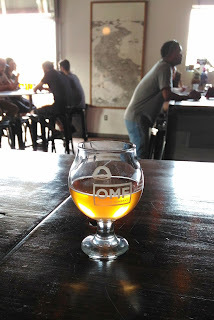 Yes, there was one that was also a bit confused flavourwise (Stuck in Rumination, their rum barrel-aged DIPA), but that’s true in so many Denver taprooms, and the overall feel was more that they were having a bit of fun messing with beer styles and treatments. By now it was well past 11pm, still early for some but sadly way too late for the nearby Crooked Stave taproom. So it was time to wend my tired way back via yet another route, thanking 3UK for free data roaming and Google Maps as I went. I genuinely did a double-take on walking past a darkened building, glancing in, and spotting what was very obviously a shiny steel brewery of some size. 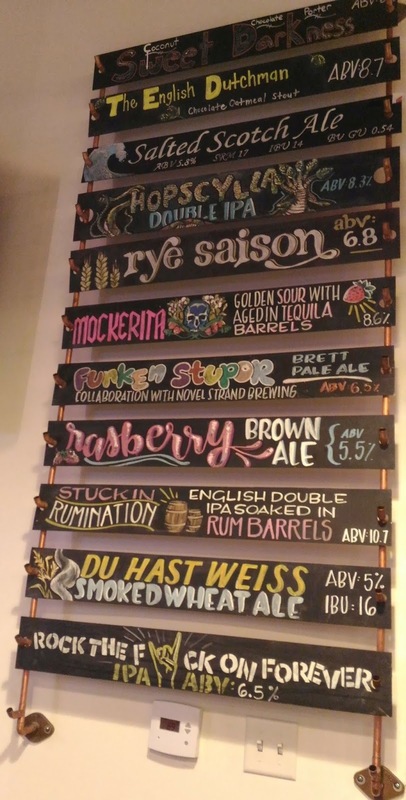 It turned out to be the new Blue Moon brewery-restaurant – the original Blue Moon Brewery in the Denver baseball stadium may well have been the first of the ersatz "crafty micros” when it was set up by Coors just over 20 years ago. Tomorrow would be another busy day – into the city, sadly too early for the downtown taprooms, to get the bus up to Boulder. It was only a short time in Denver, but an interesting one – a view of how much modern beer and brewing can help regenerate, but how it also is at risk from pulling in what we used to call yuppies. Maybe that's just the way this process works, and we've all failed to spot – or have just ignored – that the next step in the so-called regeneration process is yuppification. Sad. *They have a 3rd birthday party set for 4th November. Earlier this year I went to a conference in Boulder, Colorado. Much as I like Boulder itself, this meant flying into Denver, and it’s been many years since I explored that city’s beery pleasures. So I arranged to travel out a couple of days early and have most of a weekend in Denver. Rather than stay in the centre or south, where I’d been before, I decided to explore the northern side of town, more specifically the up-and-coming arty area of RiNo, or River North. Five or ten years ago, I don't think there wasn't much reason for most people to visit this part of northern Denver – especially not after dark! Flat, dusty and sun-baked, like much of the south-western US, it was an area of railway sidings, light industrial units and warehouses. There were local residents, but mainly poorer ones. With time, that included artists and hippies as they were priced out of other areas, and following them came the hipsters and the semi-curse of arty areas everywhere – gentrification. I say semi-curse because while it's driving property prices up and by the look of it pushing industry out, it's pulling in infrastructure investment – I haven't seen so many building sites and roadworks in ages. And of course what infrastructure expansion is complete these days without a craft brewery or brewpub? One RiNo brewer said from almost nothing four years ago, he now has 13 other breweries within a mile, and I can well believe it. There's even more downtown, of course, but that's more like two miles away and they've been there rather longer - since 1988 in the case of Wynkoop, Colorado's first brewpub and craft brewery. RiNo had the advantage for me of being on the train line from the airport to the main station, so with a bit of planning (and a 3-UK SIM card for free roaming data in case I needed to re-check the map) I could get off a couple of stops early and walk to the room I’d booked through AirBnB. On my walk I heard cheerful noises and spotted Black Shirt, one of the local brewpubs. So after dropping off my bag, I headed back there. It’s a friendly place, with modern art for sale on the walls and a crowd that seemed more grunge and arty-local than hipster. 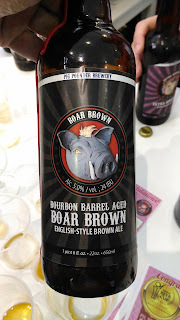 The beer was the usual ‘craft’ mixture of styles – a very nice Saison alongside assorted IPAs, a Porter, a Stout and of course something barrel-aged, in this case a sour ale aged in bourbon barrels. 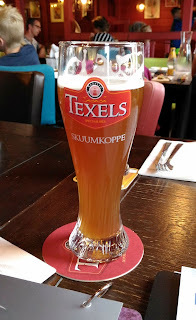 Most were rather good, even the inevitable Kölsch, a style that’s everywhere now and has emerged as a gateway beer, not just for lager drinkers exploring ale but for ale brewers looking for an easy way to produce something lagery. Waking the following morning, I made coffee and started planning my afternoon. Epic Brewing's tap-room was in the right direction and opened earlier than some of the others, so that was my first target. Walking in, it was clear that a lot of money had been spent here – a theme that was to flow through the afternoon. After a couple of excellent beers chosen from the dozen-plus taps serving the clean and airy bar area, it was time for their first guided brewery tour of the day. 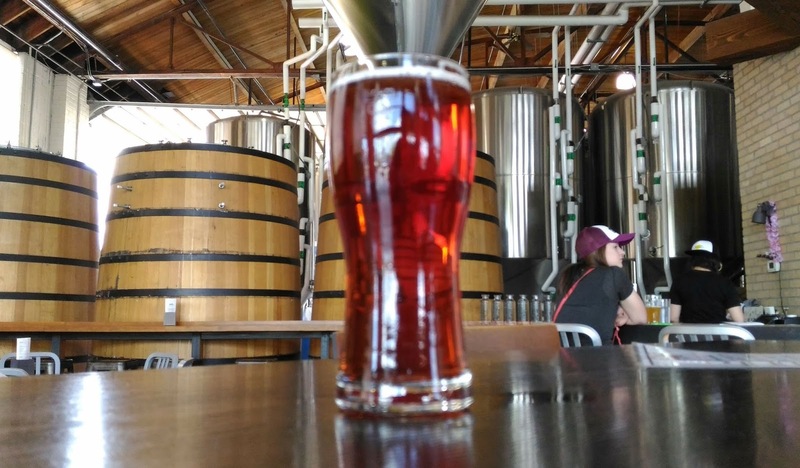 It turns out this isn’t the original Epic – it’s an offshoot of a Utah brewery, which opened a Denver branch in 2013 to get around Utah’s strict alcohol laws. For example, in Colorado you can sell packaged beer direct from the brewery. When it opened in an old high-roofed auto workshop, Epic was one of the first in the area; it’s now 50% bigger than its parent and while its brewlength is still a ‘micro’ 20 barrels, they’re brewing 24 hours a day, five days a week, and its array of fermenting vessels (FVs) includes ones holding 120 and 180 barrels. These are for the biggest sellers, needless to say. Having as many as nine brews go into one FV also helps with consistency, as it smooths out batch variation. 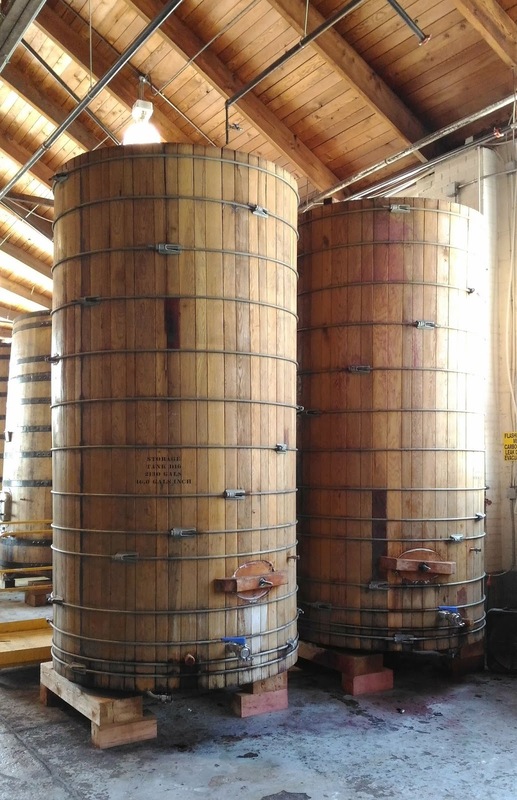 Like most micros Epic also does barrel-ageing, but unlike most they have foeders too – tall wooden vessels that tower over the bar area. They do some kegging and bottling, but most of the beer that goes offsite is canned on an automated microcanning line. Sadly, while they do export to a few countries, none of them’s this side of the Atlantic. By now it was starting to get a whole lot busier, and the food truck had opened for lunch – Colorado might be relatively relaxed about brewing and selling beer, but apparently it’s a pain getting the permits to sell hot food as well. So most brewery taps and brewpubs skirt around it by inviting mobile canteens to park up outside and then allowing patrons to bring their food inside. It was the same at my next stop, Ratio Beerworks, a brewpub where the Texas BBQ truck served up a paper plate of excellent pulled pork for just a few dollars. Ratio was an odd one otherwise – all the beers were well made and tasty, yet somehow it felt like there wasn’t any great inspiration and it was trying just a bit too hard to be fashionable. Then again, while its ‘industrial chic’ concrete and sheet-steel styling would be pretty drab in another climate, in the Colorado sunshine it worked pretty well. The terrace in particular was cheerful and bustling with groups of friends, most with lunch in mind and several with dogs in tow. Our Mutual Friend was a bit of a shock at first. After the airiness of Epic and the sunny terrace at Ratio, it seemed, well, gloomy! Before long though I came to welcome the cool shade inside what felt almost like someone’s front parlour, albeit a very large one. 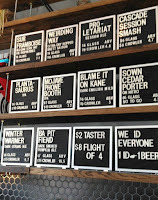 Beyond the bar, I could see into the space behind where the 7-barrel brewkit lives, and above the bar was an eclectic list of beers – a few of the craft-standards you see almost everywhere now, such as IPA and Saison, but also a Mild, a Winter Warmer (in the Colorado summer?!?) 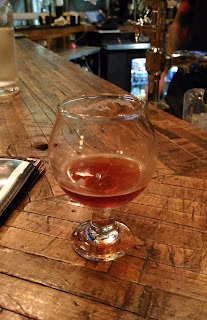 and a Smoked Pumpkin Ale – I assume it was the malt that was smoked, not the pumpkin, but you never know. 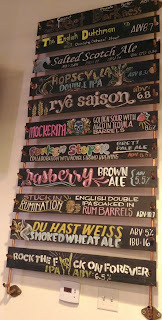 The OMF beers were more variable – the Smoked Pumpkin and the Raspberry Sour were excellent, for example, but the Mild was a bit odd – notes of toasted fruit and rye bread don’t say Mild to me. I liked the place though, and would have stayed longer, if not for the jetlag catching up. It was time for a siesta, before the evening part of the crawl…. 1. Discover American Pale Ale and IPA, be amazed by how much flavour it has compared to the industrially-produced and heavily-advertised lowest common denominator swill you’ve been drinking, and copy it verbatim. This is how most craft beer movements start. 1a. Ditto, but with British or Belgian ales. 2. Finally realise that if you’re just going to copy the Americans you probably can’t win – the real thing is better and has economies of scale. Plus it’s increasingly available everywhere, especially as good US breweries sell out to (or ‘partner with’) multinationals who already have strong distribution networks. Your only real advantage is local provenance, so you substitute local ingredients, for example to produce a German IPA or an Italian Saison. 3. Try to come up with a pretentious twist – adding pink peppercorns, say, or ageing in Tequila barrels. Of course, there’s a good chance other small brewers will also think of it, in which case it’ll be passé even before it hits the shelves. Worse, a few of the regional brewers are pretty fast to copy this sort of thing, again with better economies of scale and distribution channels. Still, if you’re the kind who rarely brews the same thing twice you’ll be onto a new fashion by then. 4. Rediscover – or in extreme cases, invent – local beer styles or traditions, then revive them and give them a ‘modern twist’. Sour Altbiers, cloying cherry beers, and souped-up Grodziskies. 5. Finally realise that what most people want is what they already know, but that some of them are willing to pay for better quality – or for a version with a better, more fashionable image. For example, many German craft brewers grew up in opposition to fizzy, bright yellow, industrially-produced ‘TV beer’, with murky ales becoming a signifier of rebellious authenticity. It’s ironic then that quite a few of them are now making Craft Pils, or Craft Lagerbier. 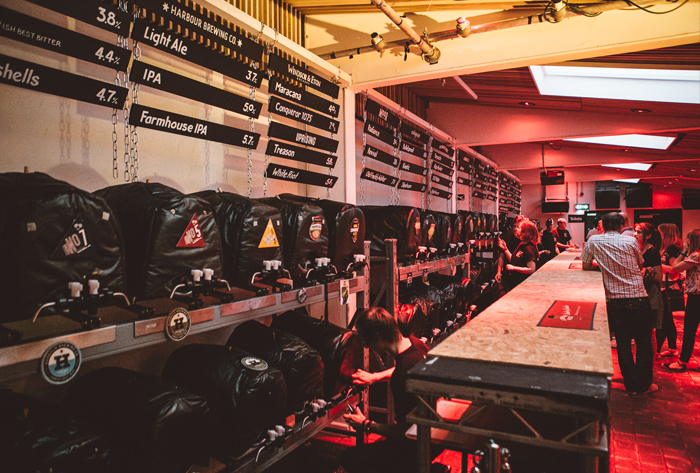 By all accounts, “The Cask Yard” at this weekend’s London Craft Beer Festival has been a great success. As last year, it’s presented and anchored by Fuller’s but features others too – not just cask ale from Sierra Nevada (Fuller’s distributes SN beer in the UK) but also the likes of Redemption, Thornbridge and Wimbledon. It’s quite a change from the first LCBF events when there was cask, but nowhere near as prominently. 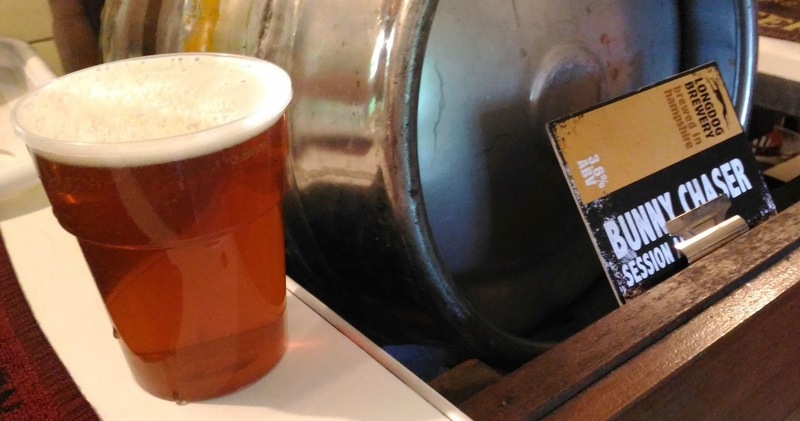 Given the major part real ale plays in London brewing, a big cask presence is entirely fitting – no, entirely necessary! #1 – Flora & The Griffin, a 7.4% rye ale, collaboration with Thornbridge. #2 – Rebirth, 6% “the original 1971 ESB reborn”, a collaboration with Moor Beer. #3 – Big Smoke, a 7% smoked Porter with Hardknott. 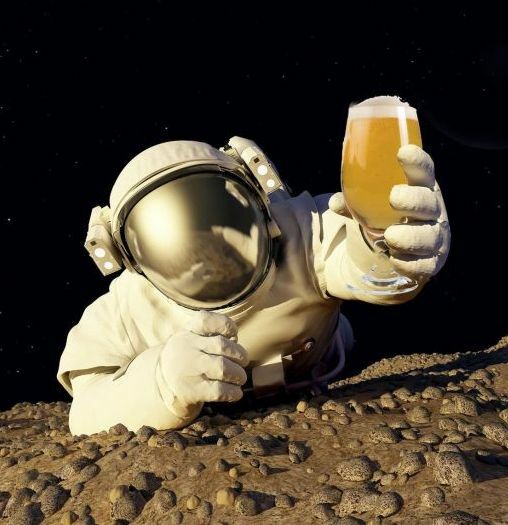 #4 – Matariki, a 5.5% New Zealand Saison with Marble. Two more to come, then – possibly during today’s final LCBF session. Sadly, I’ve neither a ticket nor the time to get over there this afternoon, but I’m hoping and expecting that all will also be on draught at this week’s Great British Beer Festival. My information is they will then be bottled and sold as a package. Edited Addendum: Sadly I didn't see any of them at GBBF, but there's also visits from Cloudwater and Fourpure mentioned now on Fuller's Twitter feed, so I guess they are the 'missing' two that'll make it six. More usefully, I've now heard from a second source that the six-pack will be sold exclusively through Waitrose. True or false, my Fuller's friends? The 2017 London Beer City programme, or festival, or whatever you want to call it, kicks off tomorrow, with events all over the city for the next 10 days. The anchor events are of course CAMRA's huge Great British Beer Festival from Tues 8th to Sat 12th. As usual this is mainly British real ale, but with the addition of foreign real ale and bottled beers, plus English wines and ciders. Before that though, there's the London Craft Beer Festival from Fri 4th to Sun 6th in Shoreditch - this is a smaller event but more focused, with 45 breweries, many of them bringing new brews and serving them themselves. A new thing this year (at least, I think it's new) is the beer embassies. Hosted at various venues around the city they will show off some of the best beers - both modern and trad - from elsewhere, for example the USA, Germany and Scandinavia. 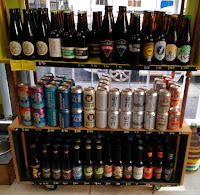 There's also a load of collaborative brews and other new beers around, including a competition where each of London's top beer stores collaborated with a local brewer on a brew. 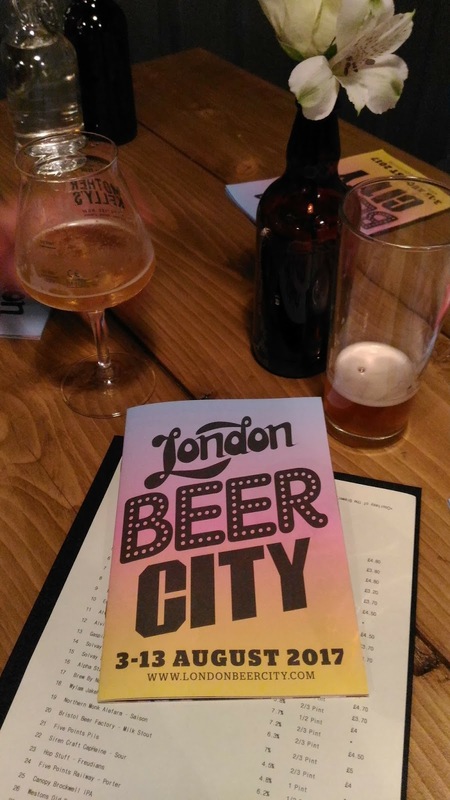 For the full programme pick up a printed copy (as seen here) from one of the venues, or visit the London Beer City website. But it doesn’t have to be like that, as I was reminded a couple of weeks ago at Imbibe, the trade show for the drinks trade, when I met Marty Kotis, the boss of Pig Pounder Brewery, one of three brewers who’d banded together under the banner of the North Carolina Craft Brewers Guild to take a stand at the show. He was pouring samples not only of his Boar Brown 5% brown ale, but also a tasty barrel-aged version of the same beer which was smooth and vanilla-accented – and had the same 5% ABV, even though it had spent time in Bourbon barrels. “We blend the barrel-aged beer with fresh beer,” Marty explained, adding that getting the taste right and consistent is extremely important – the brewery is actually a spin-off from his restaurant chain, so he and his team are all somewhat flavour-obsessed! 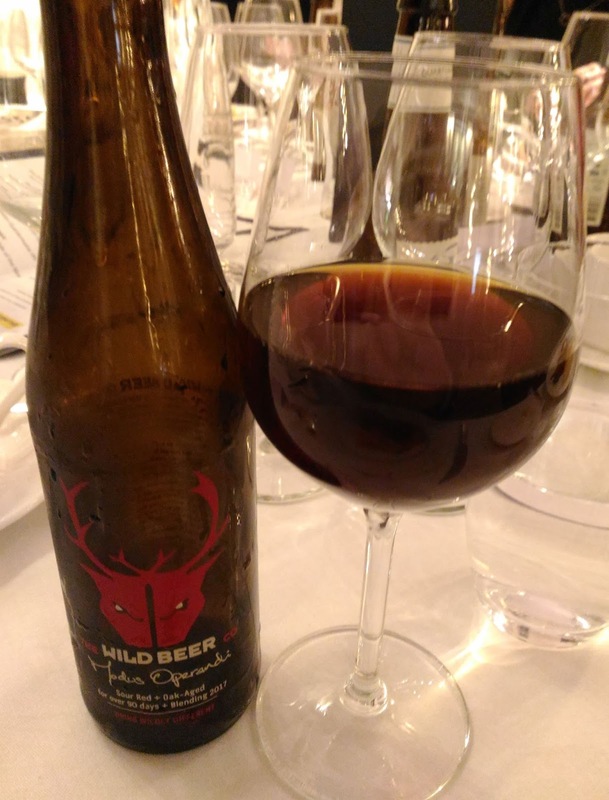 It reminded me of a time around a decade ago, when I was in the Hock Cellar at Fuller’s Griffin Brewery for a taste training session organised by CAMRA and hosted by brewing director John Keeling and then-head brewer Derek Prentice. Towards the end of the evening, John brought out a pet project of his as a surprise – a sample of some 8.5% Golden Pride that he’d been ageing for months in a Glenmorangie cask. It was intriguing, but also somewhat harsh and woody – and also very strong, around 12%. John said they were still trying to work out what to do with it and the subject of blending-back came up. Fortunately we also still had a jug of ESB on the table, so with a little bravado I topped up my half-glass of barrel beer with ESB to see how that might work – and the answer was “very nicely indeed!” The fresh beer filled out the body and mellowed the harsher notes, while still leaving the warming spirituousness in place. 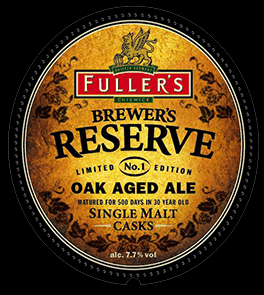 When Fuller’s subsequently released John’s various Brewer’s Reserve vintages in bottle, they did the same. It wasn’t just for the flavour, though – John explained that there was also a crime called Grogging, which dates back to the 1800s. (You can read his longer version of the story here.) Not only can there still be a couple of pints of whisky left in an ‘empty’ cask, but some alcohol also seeps into the wood. So unscrupulous types would buy old barrels and slosh water into them to get out and sell the last of the alcohol – without paying tax, hence the offence, and the need to get the original ABV back in order to mollify the Revenue. So, blending-back. Why don’t more brewers do this? Perhaps they do, but they prefer not to talk about it. Anyone seen it done elsewhere? 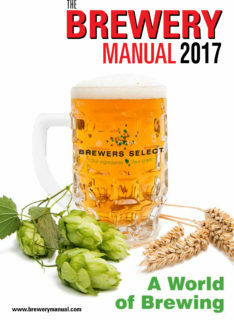 That's the implication from the 2017 volume of The Brewery Manual, which aimed to survey all the working brewers in the UK. Its researchers reckon there were 1544 "commercially operational national, regional and craft/micro brewers" in the UK last year. Of these, the vast majority - 1505 of them - were smaller producers that brewed less than 30,000 hectolitres (18,330 barrels). They add that 60 breweries started operations during 2016. That's way down on the 100+ numbers recorded in each of the previous five years. At the same time, there were 58 breweries that ceased operations and a few more that are still in business but are no longer brewing, which means that the total of working breweries has actually gone down since 2015. Some observers have argued for a while now that the rapid growth in microbrewing was not sustainable, and that a period of 'rationalisation and consolidation' was on the way. Brewery Manual publisher Larry Nelson agreed, suggesting that "it could be the start of a slow contraction in brewery numbers. "After years of rapid expansion in numbers the industry has been due for a correction," he continued. "The early numbers for 2017 openings suggest that this may be the start of a slowdown in new brewery growth. "That isn’t necessarily a bad thing for craft. When the American craft brewing industry underwent a contraction in numbers at the end of the 1990s, demand for craft beer continued to rise year-on-year." 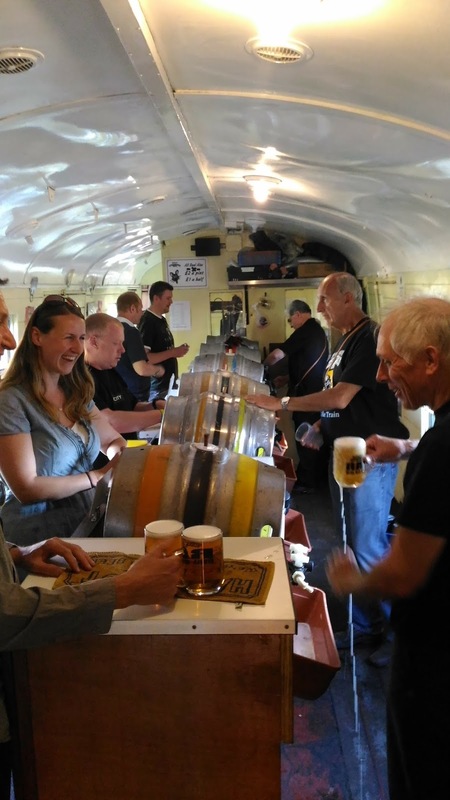 The invitation to take a trip on the Watercress Line’s Real Ale Train – the RAT of the headline – came out of the blue. I know there’s a bit of an overlap between real ale fans and lovers of railways, but every time I’ve come across a beer festival held in association with a heritage rail line, the beer part was literally station-ary. So the idea of the bar being aboard the RAT was intriguing! Welcome to Platform 3 in... when, exactly? 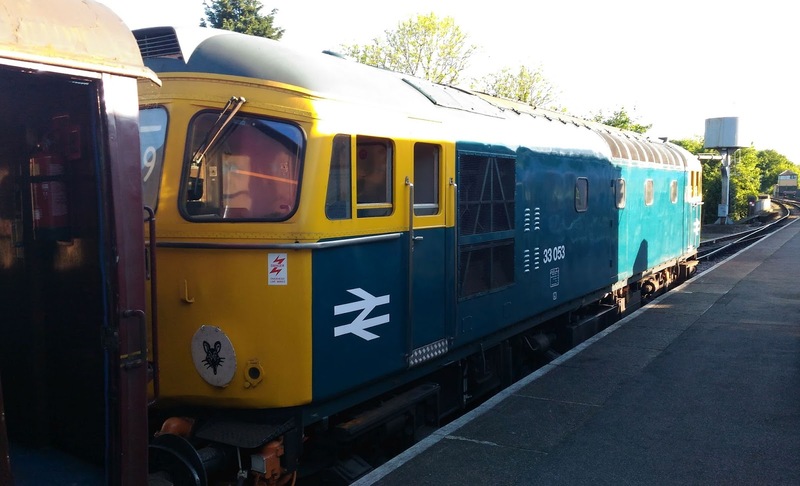 It’s over an hour from Clapham Junction to Alton, where the Watercress Line – or to give it it’s proper name, the Mid-Hants Railway – starts. Arriving on Platform 1 on a modern SouthWestTrains sliding door conveyance, we were a bit confused. 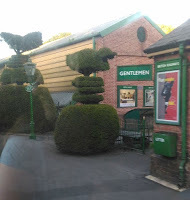 There were no steam engines or whatever in sight, yet even the SWT platform felt slightly unusual, with its metalwork painted not in modern dark blues but in dark green and cream. Even its ticket office was a – very welcome! – return to the past, with wooden floors and readily accessible, airy and clean loos. It was clearly SWT-only though and it took a few moments more to work out that we needed to find Platform 3. Sadly this is accessed not by the attractively ancient (and closed) footbridge nearby, but by a shiny modern one further down the platform. Still, coming down the steps the time-shift was complete, with staff in proper uniforms with waistcoats and peaked caps, doors marked “Station Master”, and posters from the 1950s and beyond. 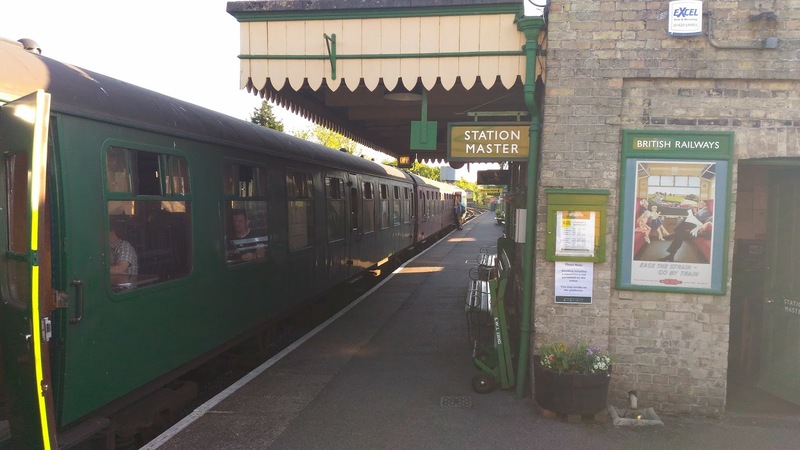 No train though, and no tickets* waiting for us – we’re early, thanks to SWT’s hourly-only service from London, so we’re recommended the Railway Arms just up the road, which happens to be the brewery tap of award-winning local brewer Triple fff. Nice pub! Returning half an hour later, we were introduced to Sue 'the boss', which seemed to mean in reality that she did a bit of pretty much everything! We later saw her helping load the galley, working behind the bar, helping clean the train, etc... Sue explained the RAT schedule: “We make two round trips, though the hot food makes one and a half because it gets off at Alresford,” she laughed. Alresford is the other end of the Watercress Line, some 10 miles away. The beer was all bright filtered with no sediment of course, despite being in normal real-ale firkins, otherwise it wouldn't survive the journey. It's why we saw something you'd never see at a CAMRA festival - a barman literally upending a cask to squeeze the last half-pint out. If there is a criticism it's that there's no cooling for the beer on the stillage - which is the bar, of course. In hot weather, as during our trip, the result is occasionally beer that's just a little too warm. Then again, the casks turn over remarkably fast, and the fresh ones are cool from the storeroom. Plus it’s only £2 a pint, with the first pint included in your £15 RAT ticket, so really there’s no complaint! For many, it’s clearly more of a party on a train. For others it’s a mobile pub, and exploring up towards the loco I even found a folk music jam session underway. As the journey proceeded, and as special trays with holes for the plastic glasses to sit in streamed from the bar – you can also buy your own RAT-engraved glass tankard for a fiver – it did get a bit noisy. But it’s all very good-natured – cheerful voices and the occasional burst of singing. 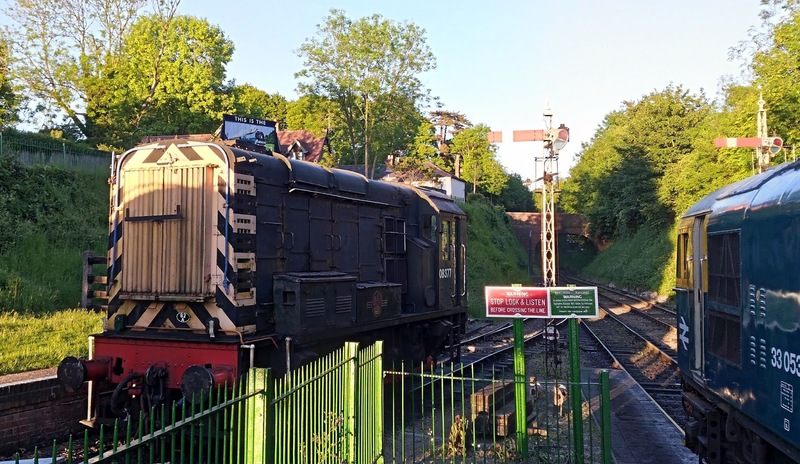 Plus while the light lasted, there’s the beautiful Hampshire scenery, the lovely 'step back in time' stations decorated with flowers, topiary and then, finally, yes – parked steam engines, lots of steam engines! (Our train was hauled by a heritage diesel, but most RATs are steam.) There's also shunters, a crane-train, and lots more. It being two round-trips, there’s three short loo (and for some, ciggy) breaks at the end-stops while they move the loco to the other end. I noticed some people left halfway through when we were back at Alton – heading back to the pub perhaps. 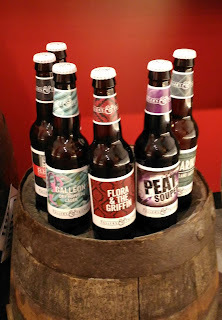 For those with staying power, the ales continued to turn over – the featured breweries that night were both from Hampshire, namely Longdog and Red Cat, but we’re also treated to a couple of other brews, such as a one-off single-hopped pale ale from Tillingbourne. The food is decent pub grub – chilli, korma, burgers – and while it’s served in take-away boxes, not on china with polished silverware, it’s reasonably priced and the cheerful volunteer staff have more than enough to clear up already! All in all, it was the best Friday evening we’d spent in a while (the RAT runs a few times a month, on Friday and Saturday evenings). 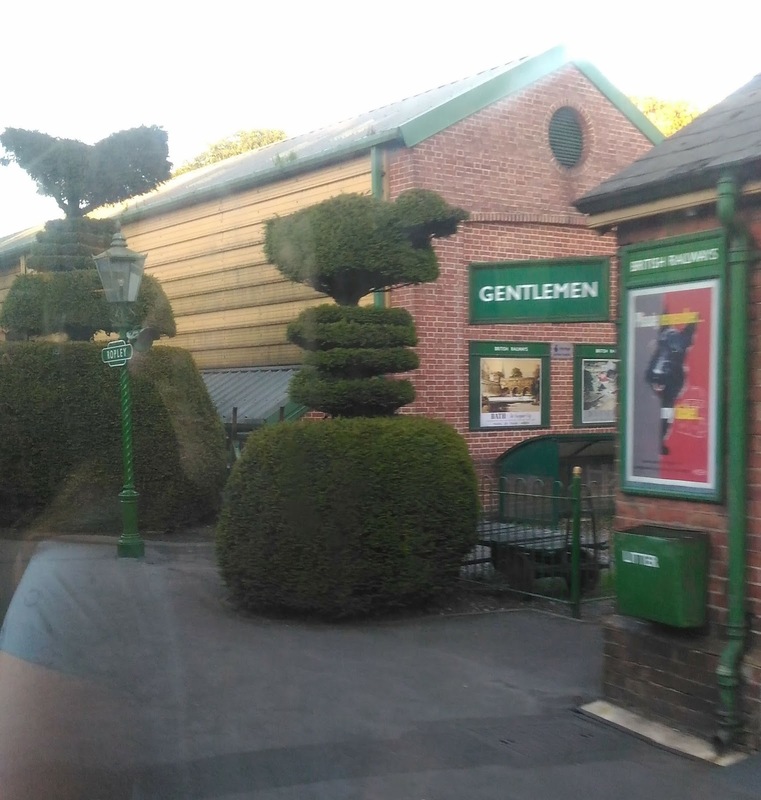 A pub on a train with good beer and constantly changing scenery, what more could you want? And thankfully you’re back at Alton just in time to get the last train up to London – a cooler and quieter journey, but one that is, sadly, rather less fun. *Do you need a disclaimer? The railway kindly supplied our RAT tickets, but we covered our own transport from London, plus all our food, almost all our beer, and our own babysitter. Phew. 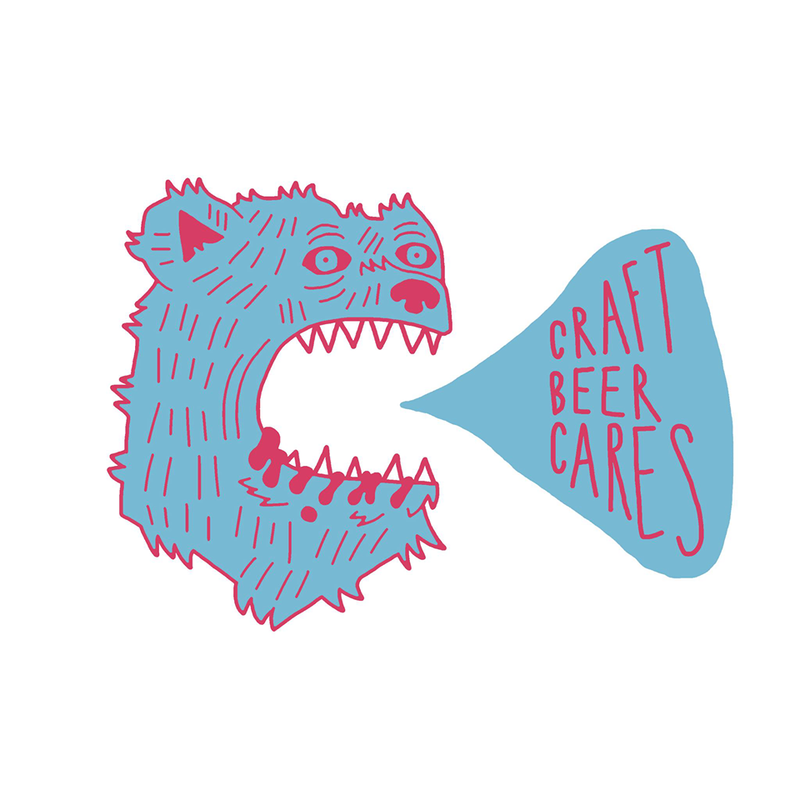 Step aside Care Bears, it's time for Care Beers! A brand new beer festival arrives in London this July and all of its profits will be donated to charity. 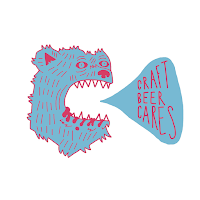 Craft Beer Cares will be taking place on Saturday 1st and Sunday 2nd of July at Brew Club in Clapton, East London with proceeds being donated to The Newman Holiday Trust and Mind, The Mental Health Charity. Beer has been donated to the festival by some of the most exciting breweries in the UK and beyond, including: The Kernel, The Five Points Brewing Co, Pressure Drop, Partizan, Brew By Numbers, Anspach & Hobday, Weird Beard, East London Brewery, Beavertown, One Mile End, Elusive Brewing, Siren Craft Brew, Cloudwater, Northern Monk, Wylam, Founders, Yeastie Boys, Hackney Brewery, Gipsy Hill and Magic Rock. In addition to this the festivals organisers promise that they have a few surprises up their sleeves for those lucky enough to grab a ticket. 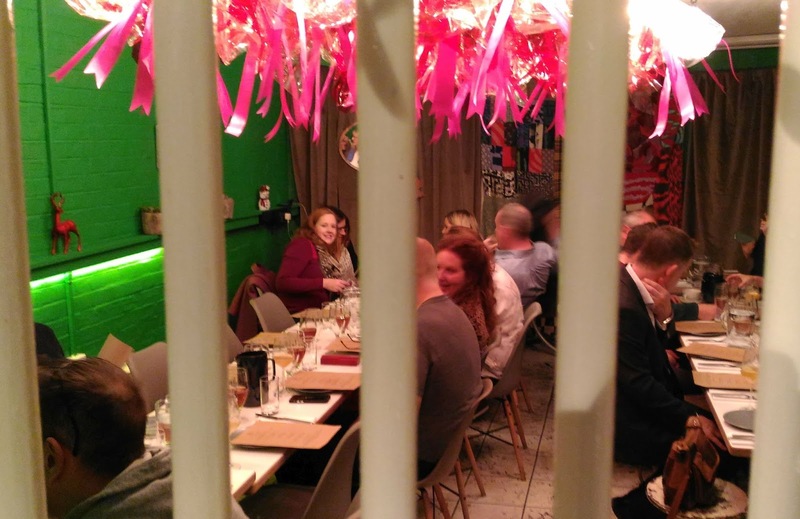 “We’ve been inspired by movements such as #CookForSyria and smaller events such as #BoozersWithoutBorders and wanted to play whatever role we could in organising something to help those in need. Our aim for this year’s event is primarily to raise funds for the charities Mind and The Newman Holiday Trust, and to scale up on previous efforts by asking for donations from the wider brewing industry. Tickets for the Saturday July 1st evening session can be purchased here and tickets for the Sunday July 2nd afternoon session can be purchased here. The festival's open from 6pm to 11.30pm on the Saturday, and from noon to 5.30pm on the Sunday. I don't know the venue, but it's in the Old Tram Depot near Clapton BR station. It's up the road from the Round Chapel which hosts the CAMRA Pig's Ear beer festival in December, if you know that. 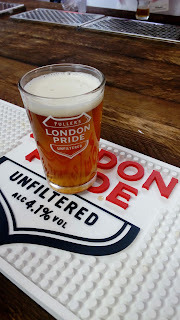 When I first heard about the launch of London Pride Unfiltered at Craft Beer Rising earlier this year, my first thought was, oh-ho, a hazy rebranding for the craft generation. But could Fuller’s make the idea work, or would it be like an embarrassing parent trying to be hip? And was it just a rebrand, or a genuinely new beer? I had all those questions in mind when I got the chance for a brief chat with Fuller’s head brewer Georgina Young – over a couple of glasses of Pride Unfiltered, naturally! First, a bit of background – I’ve seen this sort of relaunch several times before, especially in Germany, where the marketeers have done a great job persuading the average Josef that all beer is yellow, fizzy and clear as a bell. The industrial Pils that you see advertised everywhere, in other words. But for the Craft Bier pioneers a few years ago, this heavily-marketed industrial Pils was the enemy, and the easiest way to state your non-industrial credentials was to make cloudy beer instead. Cue lots of murky unfiltered Pale Ales, IPAs and others. The first thing George pointed out was that Pride Unfiltered is hazy, not murky or cloudy. More significantly perhaps, it needs to be reliably hazy – consistency is absolutely essential for a brewer such as Fuller’s. “It’s really hard to get this level of haze just right,” she said, adding that “The haze is not yeast, it’s protein – quite fine.” She also stressed that while the basic recipe “is pretty much the same” as regular Pride, including Northdown and Challenger aroma hops, there are changes. Most notably that Unfiltered is also dry-hopped with Target. Not too surprisingly, Unfiltered is very like regular Pride, but is drier and less malty-fruity, although that will in part be due to the lower serving temperature. There’s earthy and spicy hops on the nose, then it’s lightly fruity and dry. And it seems to be doing well – on a recent visit to a Fuller’s pub which had Pride Unfiltered on tap alongside a couple of guest keg pale ales, the barmaid said it was pretty popular. The notable thing is it’s definitely not aimed at the keg Pride drinker, and indeed the Fuller’s folk say there’s no plans to replace keg with Unfiltered. They’re also increasing the range they distribute from other breweries, with Sierra Nevada the most prominent example. One of Fuller’s sales team noted that “We brought over 14 Sierra Nevada seasonals last year, this year there’s six definites plus maybe two or three more. This year’s list include Otra Vez, Sidecar and Tropical Torpedo.” Yet more reasons to visit the bigger Fuller’s pubs – although I don’t expect to see these in my local. "Why is everything in cans these days?" mused my friend Richard, examining his tin of Five Points Pils. "Funny you should ask that," I replied, "I'm in the process of writing an article about it, as a follow-up to one I wrote for an engineering magazine a couple of years ago..."
Back then, micro-canning was something of a technical novelty, which is why I wrote about it for an engineering readership. A Canadian company, the slightly confusingly named Cask Brewing Systems, had realised that conventional drinks canning machines, which were giant multi-million dollar investments flooded internally with carbon dioxide to keep out harmful oxygen, could be significantly simplified and also reduced in size. 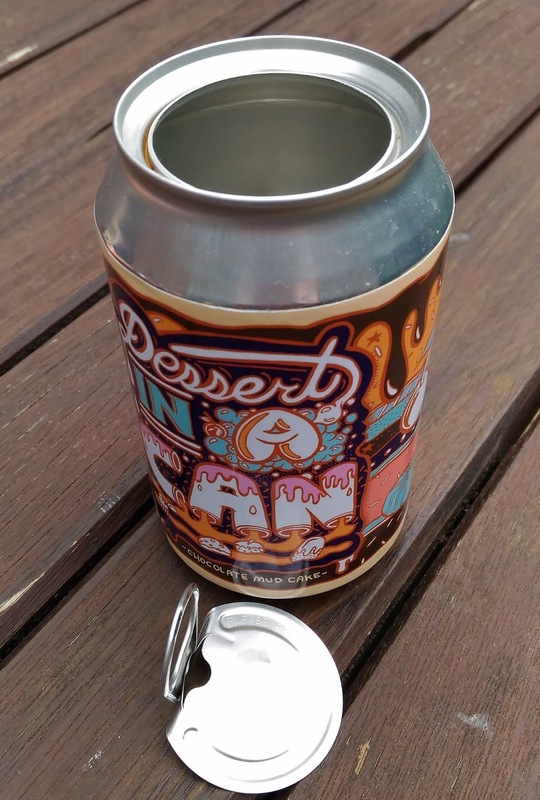 In fact, they made them so small and simple that hobby brewers could use one at the homebrew club to can their own beer, one can at a time – a concept that's re-emerged recently as the crowler, a non-reusable version of the growler take-away beer flask that's actually a large can. Avant-garde US breweries had loved the slightly subversive idea of a mini-canning machine for craft beer, and the first few UK brewers were following suit. There were sceptics, of course – often classically-trained brewers who couldn’t believe a machine that simple could avoid oxidising their beer. However, my own background in engineering told me that what the machine makers were saying made sense. The big challenge at that point was labelling. 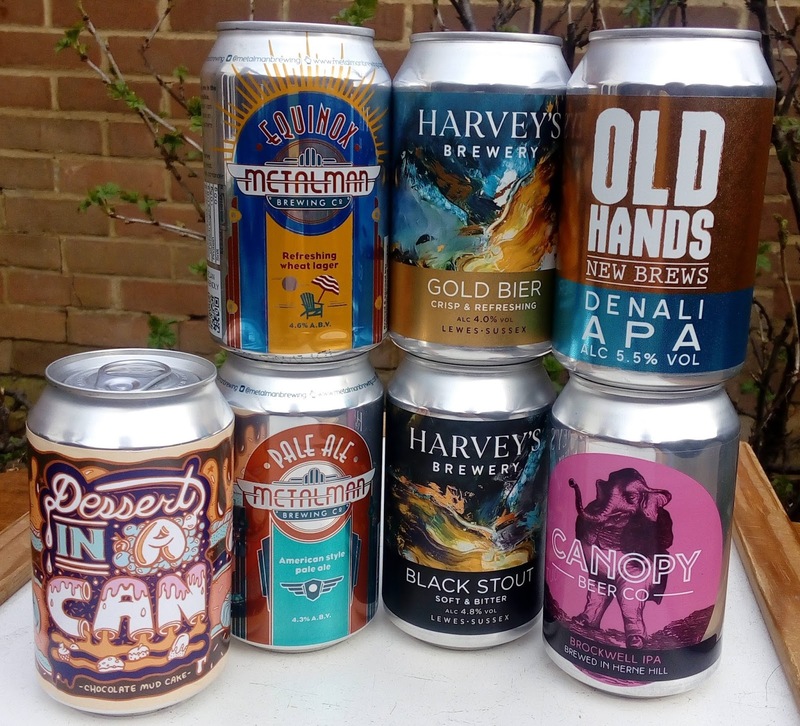 The ideal is a printed can, which is what the supermarkets, soft drinks companies and bigger breweries use, but these require a long print run to justify the cost of setting up the printing machine. The last I heard, the minimum print run was 100,000 cans, and to get the best price you needed to order half a million of a given design! People were experimenting with alternatives such as sticky labels, but unlike glass bottles, empty cans have very little structural strength, so rolling a label on risks denting or even crushing them. 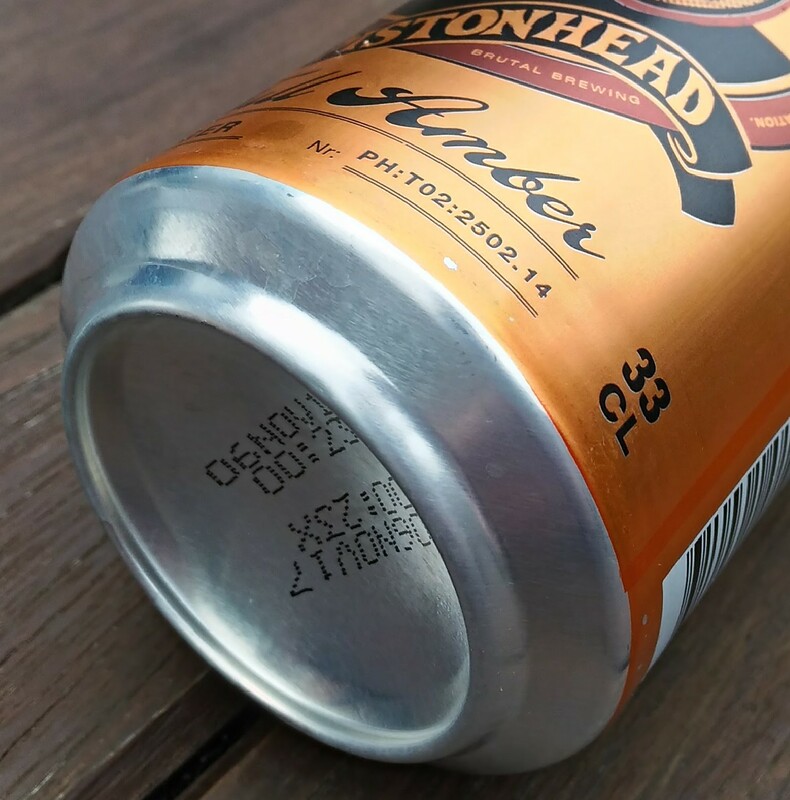 Some had even tried printing directly onto the cans using inkjet-type printers, but in the main they were focused on canning those beers that could justify buying 100,000 printed cans. 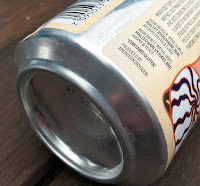 Fast-forward two years and beer cans have become high art – a smooth canvas for the artist and designer, and a signifier of craft, not cheap supermarket booze. And a lot of that is because the labelling problems have been licked, meaning you can now use your micro-canning line as it was intended: to put a single brew into just a few thousand cans, even when that brew is a one-off. Well, mostly licked. 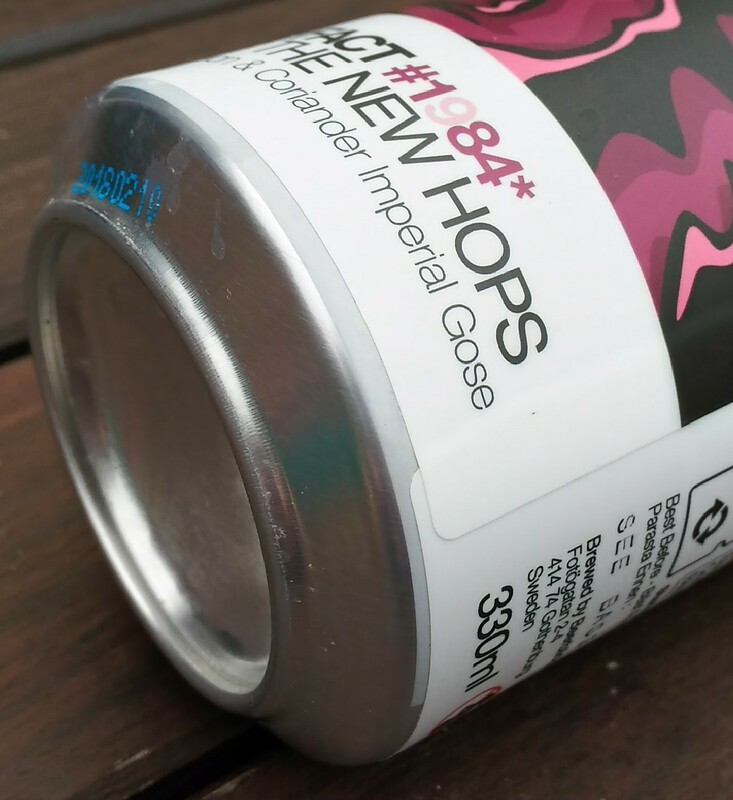 I spoke to Metalman co-founder Gráinne Walsh at the Irish Embassy’s craft event earlier this year – when I interviewed for that 2015 story, they canned one beer regularly, now it’s four, all in printed cans. On top of that, they can several of their seasonal beers, all using sticky labels on plain cans. So there’s swings and roundabouts, but sticky labels definitely seem the most popular method. I’ve spotted at least two types so far – sheet plastic ones that wrap all the way round, and ones that look more like plasticised paper and wrap with a gap, like on most bottles. Both are fairly easy to spot, though some of the plastic wrap-arounds feel like printing if you’re not thinking about it. There is a second popular method though, which is essentially to shrink-wrap the can with a printed plastic label. This feels great and can be quite hard to spot at first, as it’s so smooth and it lacks the tell-tale label edges. Once you look though, you’ll almost always feel the edge of the wrap on the collars of the can. I said above that the big problem for micro-canning two or three years ago was labelling – well, it was, but it wasn’t the only one. The other was overcoming an initial impression that it was ‘cheap and cheerful’ and lacked quality – that yes it was canning, but it wasn’t real canning. The thing is, not only is micro-canning gear cheap enough for even a small to middling brewery to be able to afford its own canning line, you don’t even have to buy it – it’s so compact that there are companies that have portable micro-canning lines. You get your beer ready, in a specified capacity and condition, they turn up with a truck or large van containing the equipment and a stack of empties, and some hours later they leave you with pallets full of sealed cans. Of course, with anything like this there’s a learning curve, both for the canners and for the brewers they work with. So while the UK’s mobile canners do a great job today, brewers tell me that wasn’t always the case when they started up. I heard reports three years ago of lagers with oxidation problems and a stout where one can in three was infected, for example. Reading between the lines though, I suspect the brewers involved were as responsible as the canners, mainly because they didn’t (yet) know how to present their beer properly. 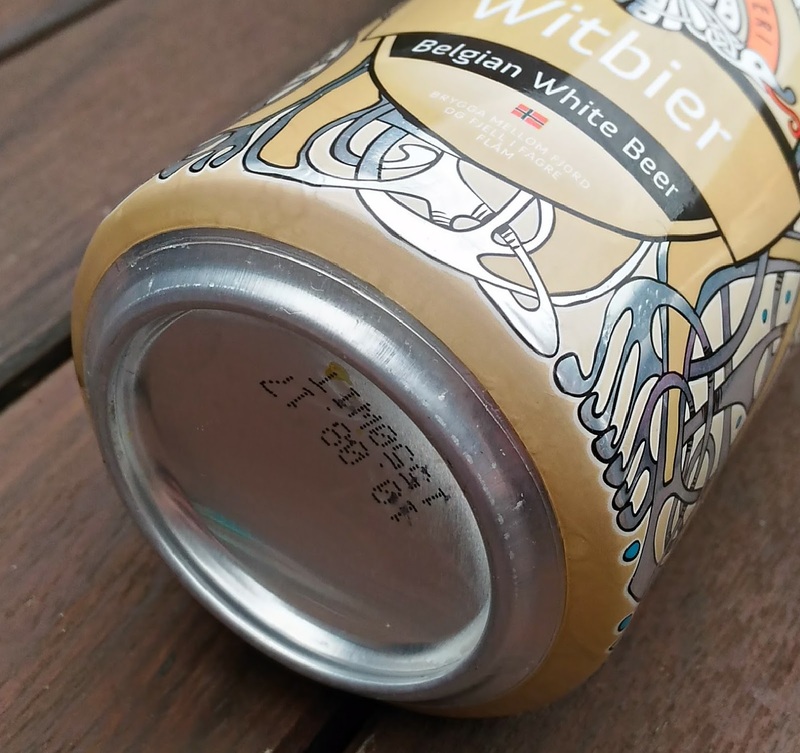 However, while those quality worries are no longer valid, some of the suspicion of low-tech canning remains – and that, combined with the subversive popularity of canned craft beer, has brought the big boys in. Just like the macrobrewers starting up or buying craft beer brands, the big machinery companies based in Germany, Italy and yes, China, who supplied those multi-million dollar canning lines are now targeting smaller-scale customers. As they bring out cheaper and smaller versions of their high-tech canneries, the micro-canners are pushing upmarket with lines that are faster and much more sophisticated than their original semi-manual lines. And the cans themselves are evolving. 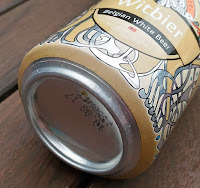 As well as the crowlers, there’s now rip-top types where the whole lid comes away to leave you a metal drinking cup. Can’t say I like the idea – I've tried two, and find you lose both the look of the beer and much of the aroma, and those are important parts of the drinking experience. But it all says – as did my visit to a Morrisons supermarket today, with craft beer cans from all over – that canned craft is not only here to stay, but is increasingly the norm.